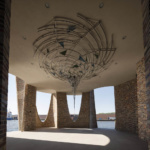 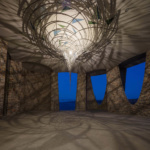 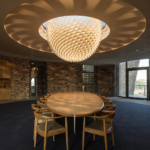 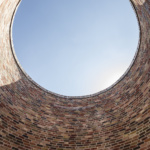 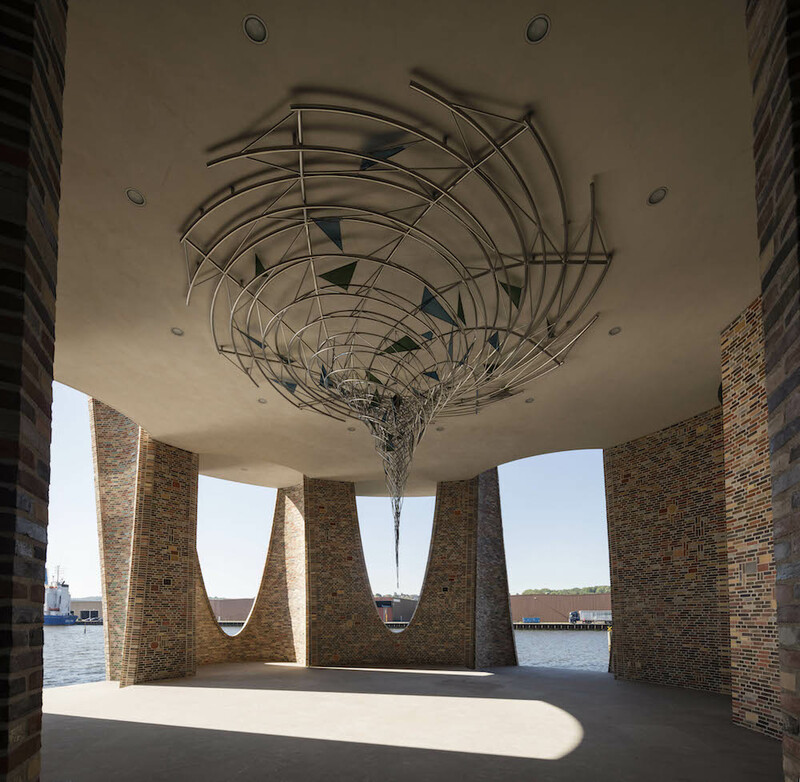 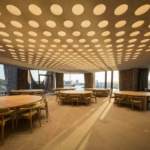 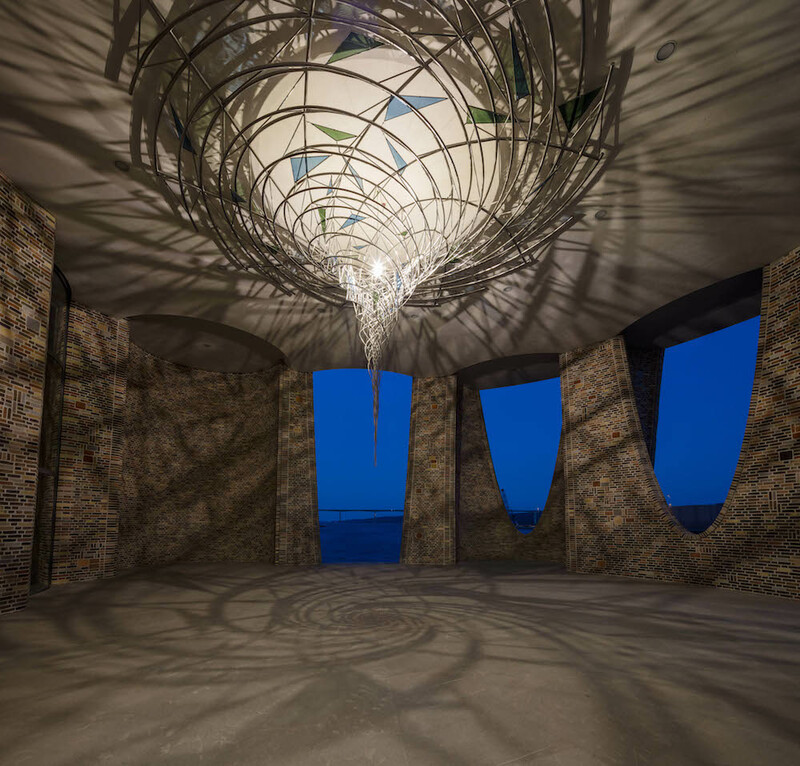 The Architect’s Newspaper recently did a studio visit with Studio Other Spaces, the architect’s office established by sculptor Olafur Eliasson and his architect-collaborator Sebastian Behmann in 2014. 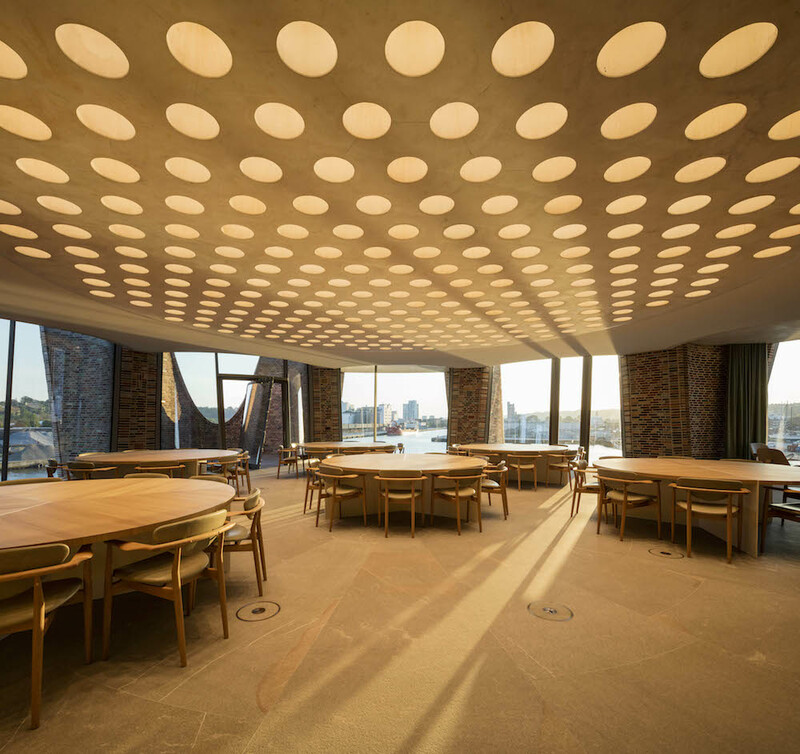 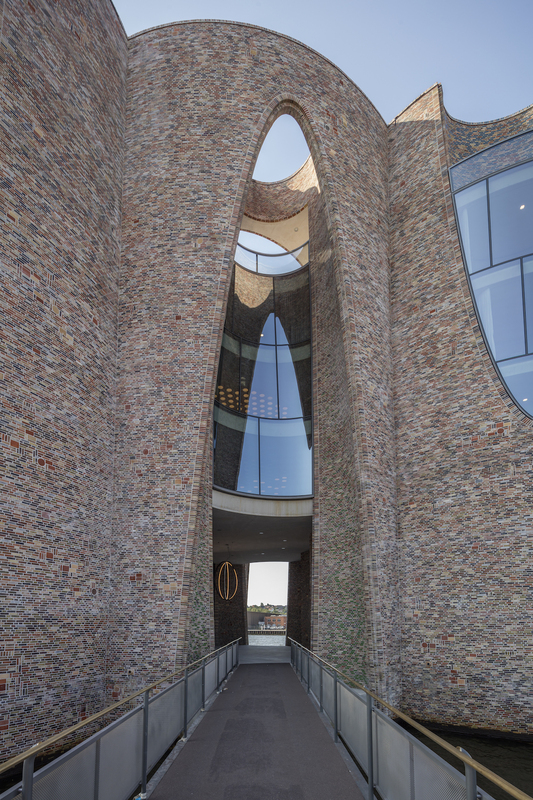 Behmann has collaborated with Eliasson and his research team since 2001 on numerous high-profile projects, and they have just completed Fjordenhus (Fjord House), their first entirely in-office building. 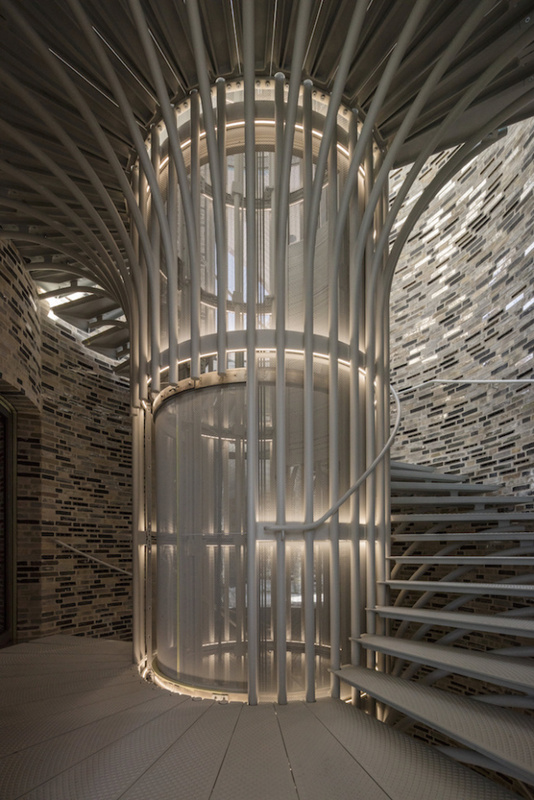 The architecture studio, like many offices today, claims to “pursues a research-based approach to the production of space that seeks to expand the estab­lished architectural vocabulary.” But unlike many new firms, this studio has already produced a strong body of built work (though these were done alongside established architecture firms). 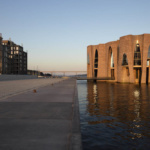 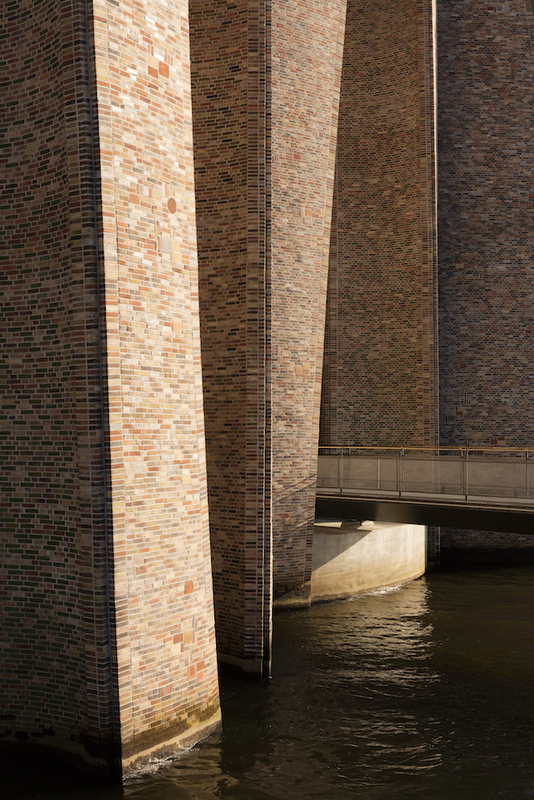 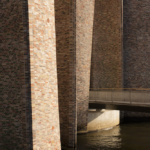 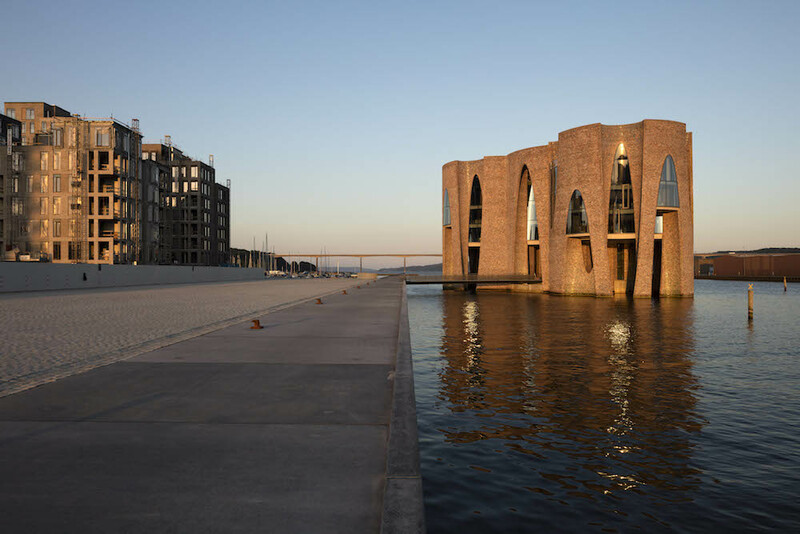 Fjorden­hus is a 92-foot-tall office building which sits literally in the water of a disused dock in a fjord in Vejle, Jutland (Denmark) for their client Kirk Kapital. 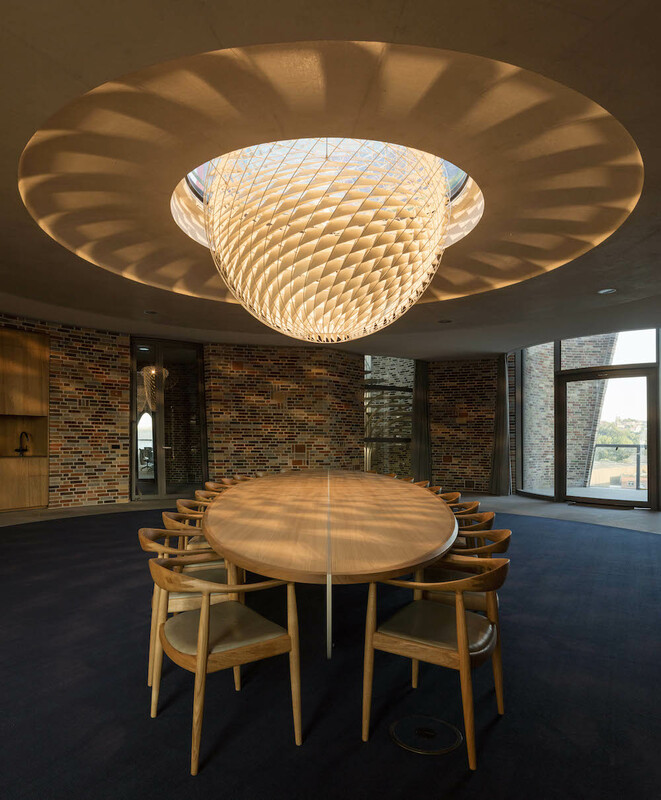 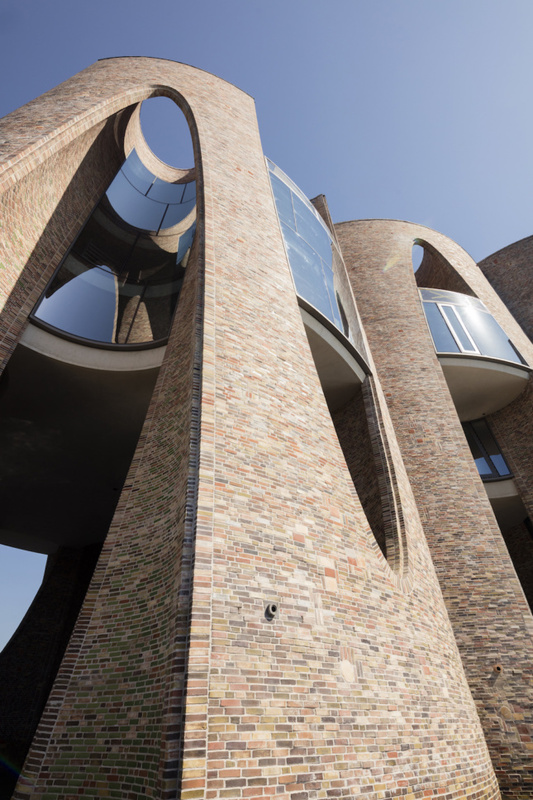 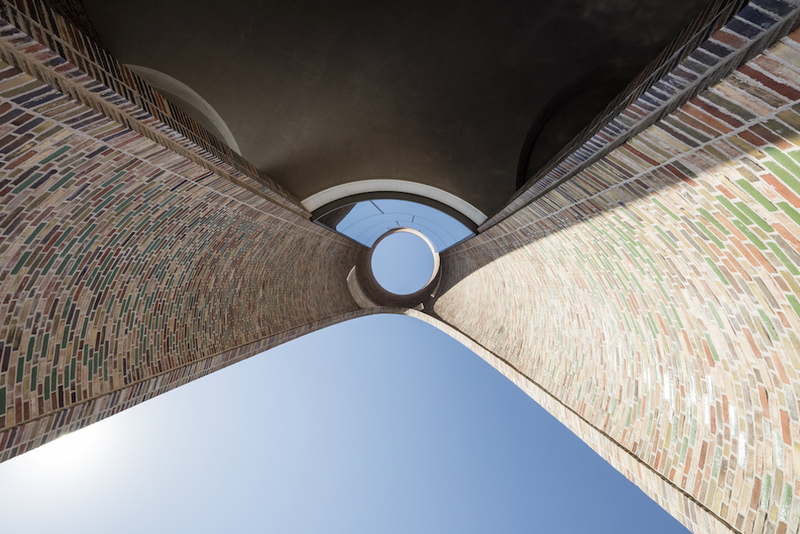 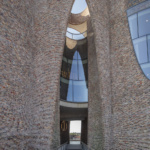 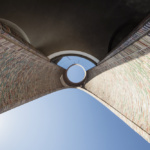 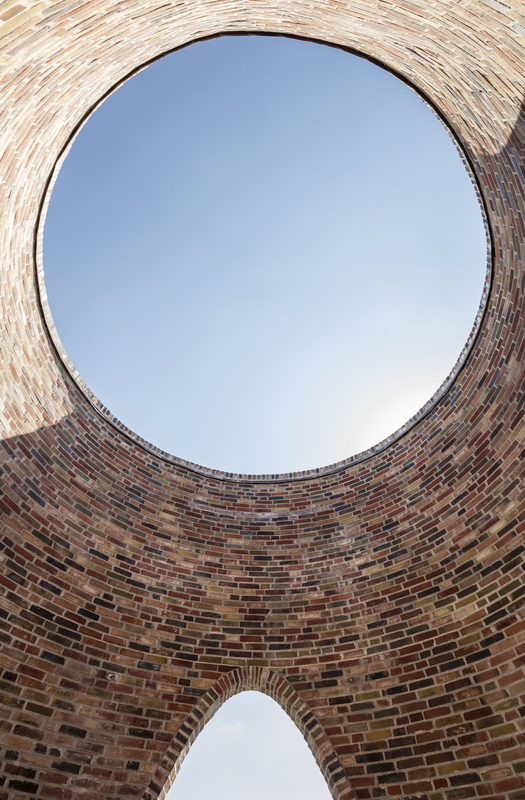 The building is a double shell of local Danish brick that forms “four intersecting cylinders” from which volumes have been carved out to create complex curved, circular, and elliptical forms, torqueing walls and parabolic arches, windows and openings. 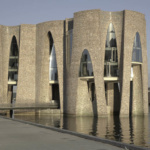 As the building sits in the water, it is accessible by a footbridge into a double-height ground floor, which is open to the public and is “permeated by the fjord and contains two aqueous zones.” The upper three floors are offices for Kirk Kapital and varying floor plans are on different levels and are organized around circles and ellipses, with specially designed furniture and lights, and are connected by spi­ral staircases and round vestibules. 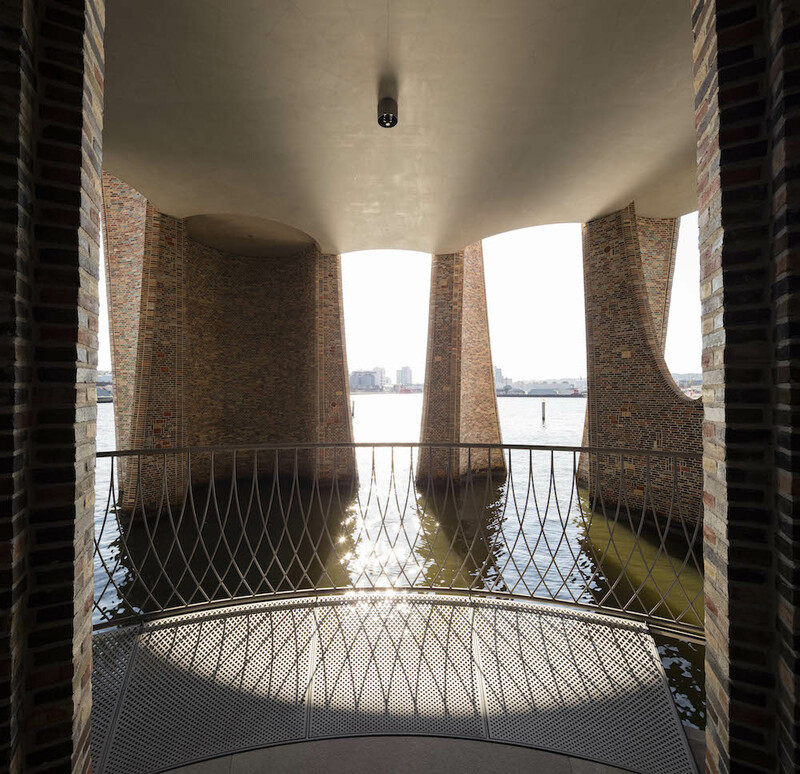 The Gesamtkunstwerk notion might be considered a dated one for architects, but with this firm, coming as it does from the world of art, it has a different idea about how to think about buildings, conceive of space and design walls and facades. 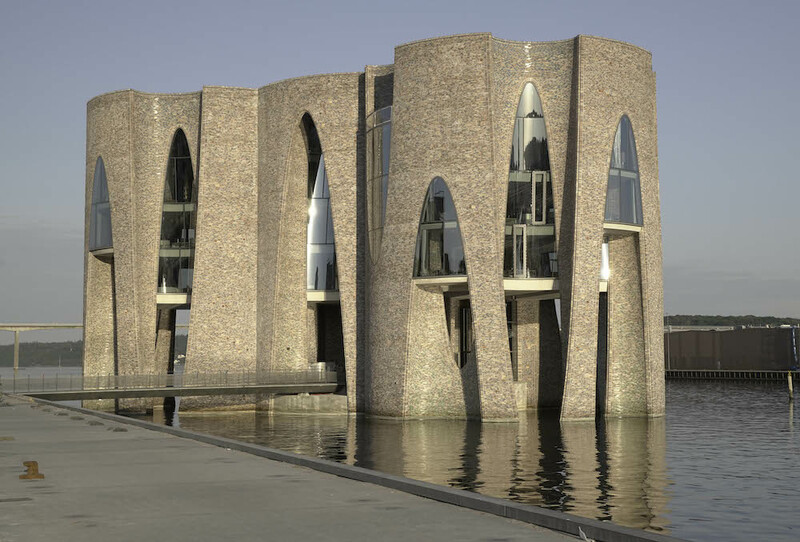 There are currently other art practices like Thomas Heatherwick’s moving into architectural design, but none have created as convincing a work of architecture as Fjordenhus.